Whitehall: a packed Saturday afternoon. I emerged from the Westminster tube station into the hubbub of this favourite tourist trap and turned my back on Parliament.. The Parliamentarians had a lot to answer for. And I strolled up this busiest of tourist highways, straight past the place I had come to see without even noticing it. Charles did not seem offended. He watched me amble past, and get distracted by the baubles and trinkets in Trafalgar Square. One Nelson’s Column later I concluded that I must have missed my mark, and turned round and pottered back, past the horseguards sitting patiently on parade amongst the throng. The Banqueting House in Whitehall. And there was a sign on the door. Closing at 12 today, it said. I checked my watch. 12:09. I was not going away without having seen The Banqueting House, and that was final. I had come a long way today. Time for some blagging. His level gaze did not falter when faced by this eccentric vision of Middle England playing Marcel Marceau at the door. “Are you a member?” he asked silently. I scrabbled for my purse and waved my card. He gestured for me to open the door. “You can go straight upstairs now,” he intoned with Jeevsian fix-itness. I gasped my gratitude and clattered up the stairs, which are Victorian, for all you temporal snobs out there, and were nowhere to be seen when Charles I walked to his death. And everywhere – in every conceivable place – there were flowers. Men were passing me on the stairs with shoulders full of daffodils, whole window boxes of Spring. Today there was a sumptuous wedding planned, and Festive was on the menu. The hall itself is a masterpiece, with a Rubens ceiling to gawp at for hours and decor which manages to be both Royal and tasteful, a tricky balance not always achieved by the dynasties which have ruled England. And the undercroft is a series of ancient graceful cellars which stretches beyond this building: Phil has toured some of the others in Whitehall, and I am left wondering if they stretch all the way up the street? But I was not after the hall, or the cellars. No: I wanted the stairs, because before they were there, something momentous happened in front of hordes, tens of thousands, of onlookers, standing just outside. Samuel Pepys was there; he had skipped school to watch. For this is where Charles I walked out of a window and onto a platform where he was beheaded. The nice lady in the shop tells me he walked from his private chambers, through the great hall, to a place about where the stairs were, where a platform was rigged outside the window. And wearing lots of thermals to stop him shivering and seeming weak, and with incredible dignity, he allowed his head to be put on a chopping block and greeted eternity. His likeness surveys Whitehall gravely from his perch, there where it happened. A memory of a grim business which has long since ceased to leave a nasty taste in the mouth and instead has been crystallised as history and folklore. 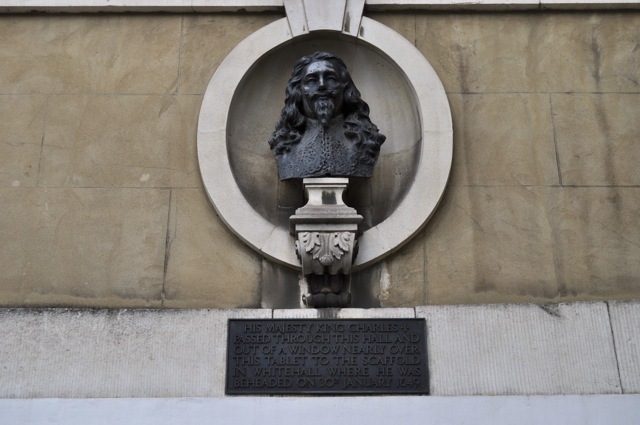 Posted in Places to visitTagged Banqueting House, england, execution, history, King Charles I, WhitehallBookmark the permalink. Beautiful building. Thanks for another little bit of history. Another one to put on the list! But as A Cromwellian Historian – you’ll forgive me if I turn my back on Parliament for another reason. Duel entendre there 😀 The bounders. Still, they’ve just given the richest a nice hefty tax cut so hats off to them. ..and a stiff neck, Roger, staring upwards. The ceiling is very beautiful. I should have appreciated it for longer but elation at cheating the closing time had gone to mt head a little. I spent most of my time standing on the stairs, gazing fixedly at a bit of wall where the window used to be. Lovely pics, Kate, wound amongst a story, great way to start the day. Thanks, Lou. It was a great way to spend my day off! You go, girl ~ love that you mimed your way past security to secure access. If only I had had the presence of mind to try that one, Nancy. As it was I just stood around annoying the flower arrangers by taking too many pictures. Kate, I never knew one could tour Whitehall. I noticed it on my first visit and always walk past. That ceiling alone is worth a look inside. I am glad the guard let you in. An extra birthday present, perhaps. It’s another gem belonging to Historic Royal Palaces, Andra. Well worth the stepping inside, as you say. Those were such cruel times, Kate, I can’t bear to think of how someone about to be hanged or beheaded must have felt. And the onlookers smiling and cheering as if at the theatre. Ugh! If it’s any consolation – which it was not to Charles – the crowd were a mixed bunch, full of Charles’s sympathisers. When his head fell it is said a great groan went up from the crowd. Thank you, Kate for taking me on this historical journey. The photos are marvelous! Pleasure, Belle. It was a rather wonderful afternoon all together. Another place to add to my list of things I want to see and do when I next visit. (As if.) After seeing so many references to Whitehall in literature, it’s a treat to get this close. It is a momentous little stretch of road, Kathy, full of memorials and statues and buildings of state. I’d love to know how far those cellars stretch along it. Nor me, Carrie. Sometimes it’s not so good to be the king. I love that he let you in! I’ve been turfed out of a few places without a minute to spare! Good One Kate! Thanks, Susan….sheer, pure, luck…and a kindly security guard. Wow, that must have hurt, but at least it was quick. Kate, I would have paid to not see his head chopped off. Have you ever seen the decor at Windsor Castle, Lame? You need sunglasses for much of it. Love that he dressed warmly for his execution! The better not to shiver and seem afraid, Tandy..
What a beautiful building, just oozing history! I felt shivers reading about the bravery of Charles’ beheading. And I’m enjoying your engagement with Pepys as he seems to help guide your field trips. And another good example of membership having its privileges…so glad you didn’t miss out!